Meg Remy is not afraid to take her time. The U.S. Girls mastermind and her eight-piece backing band stood on the stage in silence for several minutes, awash in red and blue light, as they waited for the crowd to pay enough attention before beginning their set. Between songs, Remy held off on beginning the next number until the crowd could sufficiently hear the interstitial audio, curated recordings that thematically fit with the songs. It gave additional weight and heft to the songs from In a Poem Unlimited, to say nothing of the songs' ornate disco arrangements, given a fresh, concert-friendly makeover by the expansive live band, complete with congas and saxophone. 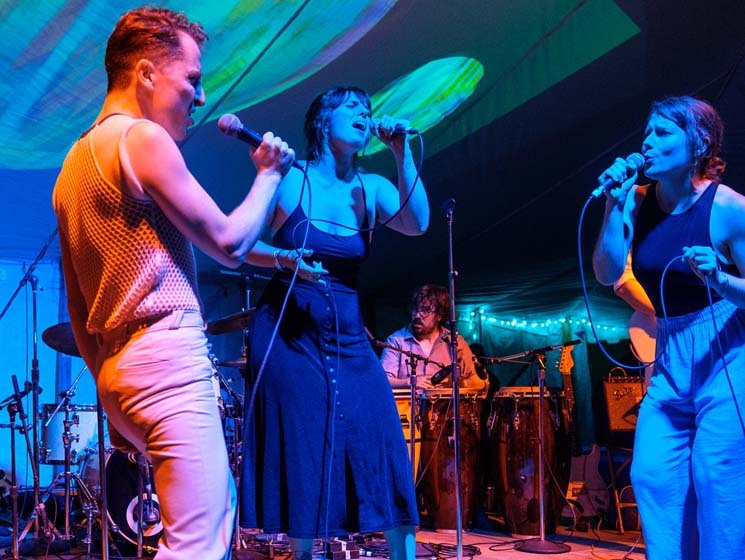 Remy's strong lyrical storytelling was bolstered by the theatrical live atmosphere, especially with mesh-clad keyboardist Geordie Gordon (of Islands and the Magic) and additional vocalist Kassie Richardson, whose dance moves quickly ignited the crowd to join in. During highlight "Pearly Gates," Gordon and Richardson's vocal duet on the chorus felt almost choreographed, which fit the atmosphere. It all came to a head — appropriately enough — with finale "Time," which stretched out beyond the ten-minute mark, featuring a second saxophonist in E Street Band's own Jake Clemons (nephew of the legendary Clarence Clemons), multiple dance breaks, a water gun dousing the crowd, a percussionist duet and several extended jam sessions. Even when Remy signalled to her band that they only had one minute left, it fit with the song and the set as a whole — her signal became part of the song. Undeterred by time restrictions, Remy worked tirelessly to ensure that each curated moment of the set was paid proper attention to, and the unhurried atmosphere juxtaposed nicely with her urgent, message-driven music. To pay attention to everything requires patience, and Remy's demeanour was a calm guiding hand through the tormented disco tracks she and her band expertly doled out.